In the next example, we will first factor out a common factor. Step 1 Write the equation in standard form. Add 2w3 to both sides. Multiply both sides by -1 to make the first term positive. Factor out the GCF, w2. So, there are four solutions: 0 (a solution of multiplicity 2), 8, and -6. The equation -w4 + 48w2 = -2w3 written in standard form is w4 -2w3 - 48w2 = 0. The graph of the corresponding function, f(x) = w4 -2w3 - 48w2 is shown. 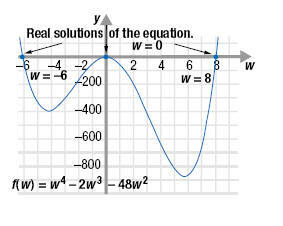 The graph touches or crosses the w-axis at the solutions to the equation: w= -6, w = 0, and w = 8.